The Chevrolet Spark is a compact city-car originally designed and manufactured by General Motors Korea. Since its introduction as the Daewoo Matiz in 1998, the Spark has undergone numerous facelifts and redesigns, refining it into the perfect car for quick city drives or long road trips. Now the 2019 Chevy Spark is here to bring some new features to the table and redefine the brand. In 2019, the Chevy Spark is seeing its most current and well-rounded model yet. With a handful of new features and an exciting new look, the Spark is bringing its compact frame and versatility to a new generation. Let’s take an in-depth look at 2019 Chevy Spark and show you how this sleek and youthful car could fit perfectly with your daily routine. From long road trips to quick errands around the city, this little car is the perfect choice. The first thing you will inevitably notice about the 2019 Chevy Spark is its uniquely compact design and bright, eye-catching colors. This year’s model is available in 10 vibrant colors, ranging from the gentle Toasted Marshmallow to the much more aggressive Red Hot. Regardless of your personality and just how loud you want to be on the road, the Spark has a color for you. The interior of the vehicle offers a surprisingly roomy five-seat arrangement with slick black seats and multiple different areas for storage. The large hatchback opens up to a spacious trunk, making grocery shopping or your trip to the little league field an absolute breeze. If you’re looking for something slightly different in your Spark, check out the 2LT trim, which offers a handful of additional features such as a keyless Open and Keyless start, chrome door handles and liftgate, and rear park assist. The unique compact hatchback design of the 2019 Chevy Spark makes this car perfectly suited to comfortably taking long trips or zipping around the city and squeezing into that tiny parallel parking space. 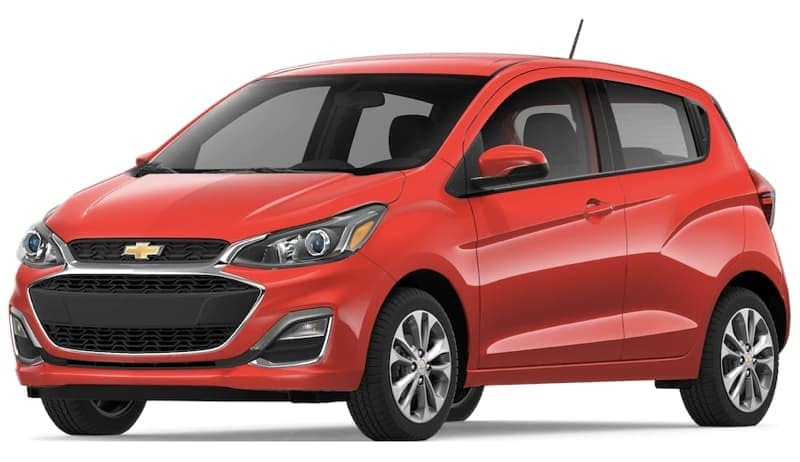 Now if you find yourself interested in what the Chevy Spark has to offer, but the base model isn’t quite exciting enough for your taste, the ACTIV may be the perfect choice for you. This special edition model of the Chevy Spark is designed for buyers who prefer to live their lives with a little sense of adventure. The ACTIV comes standard with 15-inch aluminum wheels and a raised suspension package for taking on those tougher streets and off roads. The car also features a leather-wrapped steering wheel, black leatherette heated front seats, unique front and rear bumpers with the ACTIV logo, and a rocker panel and fender trim. Lastly, the ACTIV comes with roof rails for lugging extra cargo and necessities for that next trip out into the deep wilderness. Starting at $17,095, this version of the Spark is a great place to look for the consumer wanting just a little something extra out of their compact. Regardless of your style or personal taste, the Spark offers a wide range of aesthetic options that make it easy to customize your vehicle down to the smallest detail. Chevy understands that buying an environmentally sustainable vehicle doesn’t mean you have to make concessions with appearance. While it’s 98 horsepower won’t be breaking any land speed records anytime soon, what the Spark lacks in raw power, it makes up for in nimble handling and superb gas mileage. The compact frame and tight turning radius make this the perfect vehicle for zipping around those tight city corners. This coupled with an estimated combined 38mpg makes the Spark the perfect economical ride for any situation you can throw at it. Starting as a city car from day one, the Spark’s lineage is evident in its handling and capabilities on the road. A drive with this car is an experience with over a dozen years of fine-tuning and optimization for smooth city driving. Despite its small package, the 2019 Chevy Spark packs in a ton of cool features and technology to provide convenience to the driver at every turn. With available 4G LTE Wi-Fi and two USB ports located in the center console, the Spark’s design aims to ensure that the driver never loses their charge or their wireless connection with the world around them. The vehicle also features a handful of other features such as the Chevrolet Infotainment 3 system, which seamlessly integrates your phone with your vehicle, to keep you entertained and up to date on traffic and directions on the road. You can also connect your various mobile apps to this system, seamlessly integrating your mobile device and driving experience. Whether you decide to use Apple CarPlay or Android Auto, the Chevrolet Infotainment system is compatible with a wide range of mobile devices. Stream music, check your maps, this app allows you to do it all from the comfort of the driver’s seat. Another key available feature of the Chevy Spark is the myChevrolet App. This unique feature allows you to remotely connect with your vehicle and execute commands such as turning it on or off, checking the oil, and setting reminders for service. It also allows you to locate your vehicle, for the next time you’re feeling completely lost in that endless amusement park parking lot. As with all Chevrolet cars, one of the top concerns for the 2019 Chevy Spark is creating the safest vehicle possible. Despite its petite frame, the design of this compact car is made to withstand tough impacts and keep its occupants as safe as possible. The entire car is wrapped in a high-strength steel safety cage and comes standard with ten airbags, providing a huge line of defense against any crashes. Some optional safety features for this vehicle include low speed forward automatic braking, which uses a sensor to detect front-end collisions when the vehicle is traveling between 5 and 37 mph. This feature will automatically apply the brakes when a front-end collision with a detected vehicle or object seems to be imminent. The Spark also offers the feature of lane departure warnings. If you were to unintentionally drift from your lane without signaling this feature provides an alert to remind you to pull the car back on track. The last notable safety feature included in the 2019 Chevy Spark is its rear vision camera and park assist. Once you shift the car into reverse, the center console projects a camera image of the rear of your car, allowing you increased visibility when backing into those tight spaces. Working in tandem with this technology is the rear park assist sensors, which will warn you if an object is too close to the car. While the safety scores for the 2019 Chevy Spark have not yet been released, the 2018 model received stellar reviews from the Insurance Institute for Highway Safety Highway Loss Data Institute. For the best deals on Chevrolet, Buick and GMCs in the greater Atlanta area, you need look no further than Carl Black Kennesaw. With over 800 new car options available at any one time, this location boasts one of the largest selection of vehicles in the entire state of Georgia. Carl Black Kennesaw also offer a large selection of well-maintained used cars from trade-ins. After passing the rigorous standards and certification process, these quality cars are put on sale for a reasonable price. Carl Black Kennesaw also offers a competitive financing program to help you as much as we can to purchase the car that your heart is set on. The professionals in our finance center make it their top priority to arrange an auto loan and lease terms that work best for your unique situation. Set up an appointment today to talk with their team of experts to assess your financial situation and see which vehicles are within your range. Once you’ve made your purchase, rest easy knowing the Carl Black Kennesaw certified service team is at your disposal. The factory-trained technicians on our site can perform everything from oil changes to complete engine overhauls, all at a competitive price. Come visit Carl Black Kennesaw today to check out the 2019 Chevy Spark for yourself, take it for a test drive and maybe even drive it back home. Chevrolet realizes that buying a car is a huge commitment and they appreciate it when consumers decide on one of their cars to be that final choice. With the Chevrolet Complete Care package, consumers can rest easy with the promise of 5-years of 60,000 miles of 24-hour roadside assistance, 5-year or 60,000-mile powertrain limited warranty, 3-year or 36,000-mile bumper-to-bumper limited warranty, a 1-month trial of Chevrolet connected services, and much more. Once you finally make that decision to commit to Chevrolet, you can rest assured that this company will stick with you and make sure you are completely satisfied with your 2019 Chevy Spark.